Yak Dash: Horns of Glory ($1.99) by Mutant Labs Ltd. is a challenging racing game that involves a bunch of yaks, and is inspired by traditional Tibetan yak racing. If you enjoy side-scrolling racing games that put your reflexes to the test, then you are sure to love Yak Dash. Usually, I’m not much of a racing person, unless it comes to something like Mario Kart. When it comes to realistic racers, like Need For Speed, I always end up getting a bit flustered and don’t find it enjoyable. However, when I saw the trailer for Yak Dash, I was intrigued because the game looked fun and quirky. Plus, the yaks are pretty cute, right? The visuals in Yak Dash are stunningly gorgeous. It has an art style that makes me think of paper craft, probably because it’s similar to South Park. Regardless, it brings charm to the game, which is already filled with bright colors, lush mountain range racing environments, and adorably colored yaks. The animations in this game are buttery smooth and run well on my iPhone 6 without any issues. The music is fairly unique, clearly inspired by traditions, so it adds even more distinctive personality to the game. Sound effects are fun and eccentric. 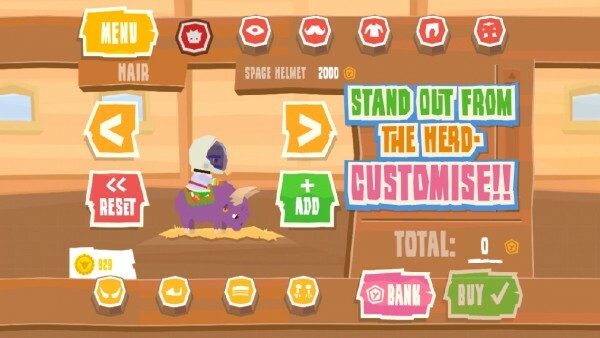 The game allows players to fully customize the appearance of their racer and yak. 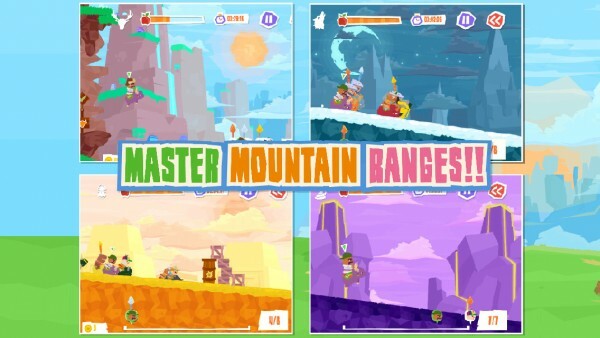 Yak Dash is a racing game with 17 levels in different mountain ranges, all of which will test your yak racing skills. 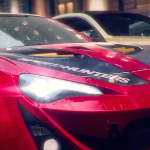 However, in order to get access to the next race, you have to rank in the top three of the level you’re on, which may take several attempts as you learn and memorize how each track goes. You’re going to lose a few times in Yak Dash, as the computer is justly intelligent, but it’s all about trial-and-error. Plus, you can only learn from failure, after all. 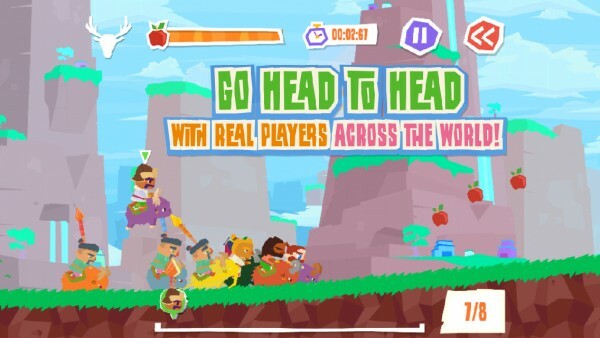 If playing against the computer gets tiring after a while, you can go head-to-head with other players from all over the world in the multiplayer races and climb the leaderboards. 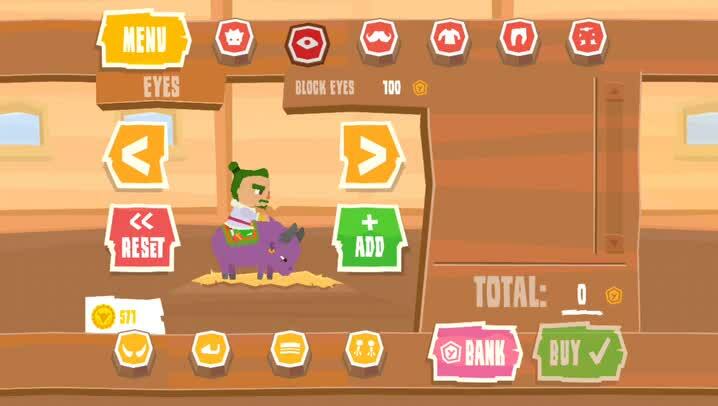 The controls in Yak Dash are simple and intuitive. As soon as the countdown reaches zero, your yak will take off running immediately. 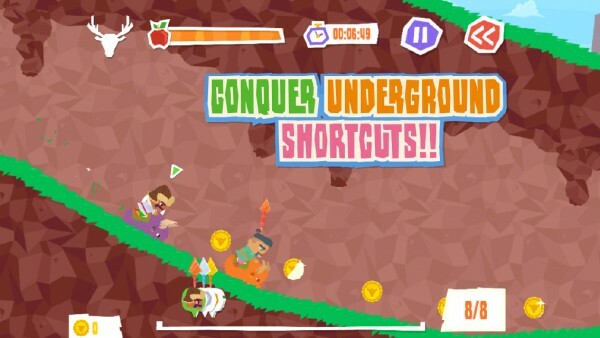 Forward movement is done automatically, so you’re in charge of jumping and dashing through obstacles. To jump, tap the left corner of the screen. To dash, just tap the right corner. If you hold the jump button, your yak can catch some air and perform flips, which will get you useful speed boosts if you can land without wiping out. 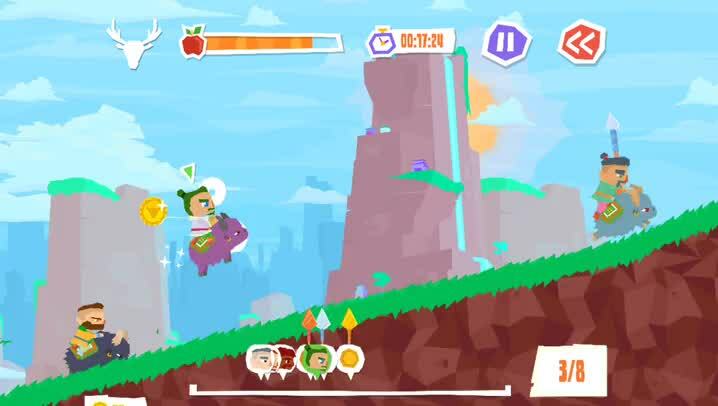 Dashing will eat up your yak’s energy, which can be replenished by gathering apples along the way. 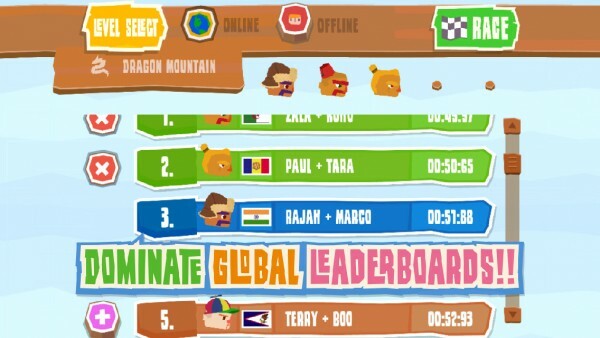 For each race, you can see your progress against the other racers at the bottom of the screen. This shows your ranking and how ahead or far behind other racers are. Remember — to get to the next level, you have to rank in the top three for the current race. There are checkpoints throughout the track too, which is where you will re-spawn at if you wipeout from a failed flip or jump. Since customization is everything, players can customize their outfits and yaks by collecting coins and spending them in the shop. If you don’t have enough coins, you can always buy more via in-app purchase. Players can also have multiple racers and yaks as well, in case someone else wants to play on the same device. As I stated before, I’m not usually a fan of racing games, but Yak Dash is enjoyable. The art style is delightful, the controls are easy to learn, and it’s just packed with fun. Plus, it’s challenging enough to keep you going, and the online part is great for competition. The customization part also makes me keep playing, because who doesn’t like to customize their character? 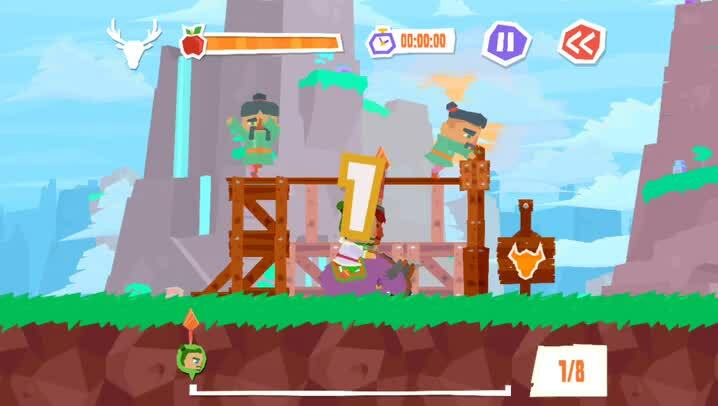 I recommend checking out Yak Dash: Horns of Glory if you are in the mood for a bizarre but highly entertaining new racing game this week. 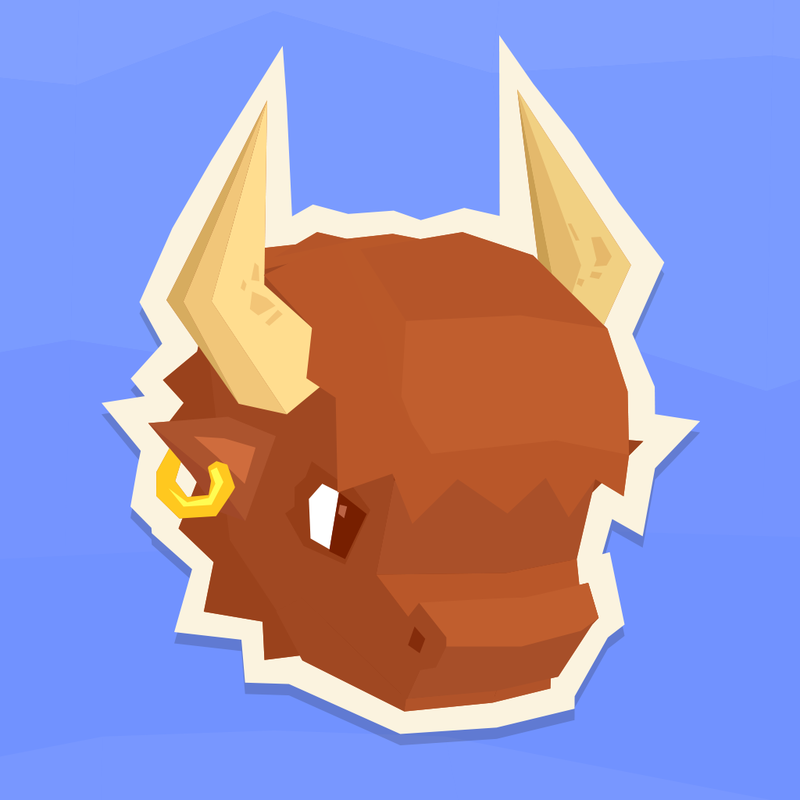 You can find Yak Dash: Horns of Glory on the App Store as a universal download for $1.99.